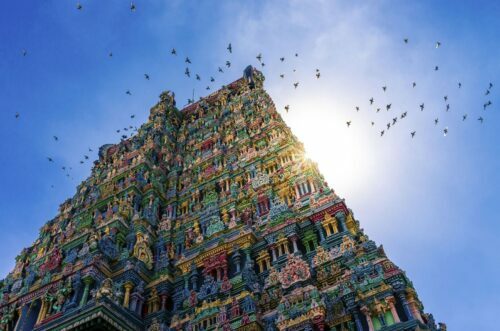 No matter your religious affiliation, and whether or not you class yourself as an architecture lover, it’s impossible not to marvel at the exceptionally beautiful temples in South India. Some have towers that stretch for dozens of metres into the sky; others are covered with remarkably ornate carvings and rainbow paint; still others comprise many different buildings, with temple complexes that occupy huge expanses of space. With histories that stretch back hundreds of years—if not millennia—these Tamil Nadu-based landmarks should be on every visitor’s itinerary. 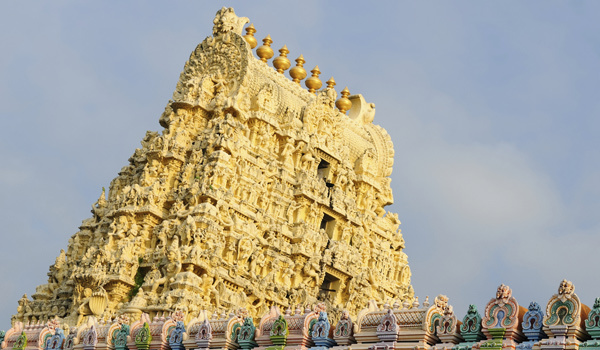 We’ve selected five of the most famous temples in South India worth visiting. Be sure to bring your camera: you’ll want to capture memories of these sights while you have the chance. 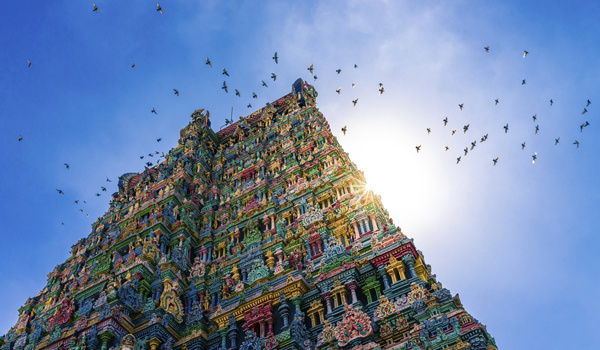 Meenakshi Amman Temple is one of the best-known temples of South India—and a classic of the Dravidian architectural style, which typically consists of a complex featuring soaring towers, buildings made from stone, and pillared halls. 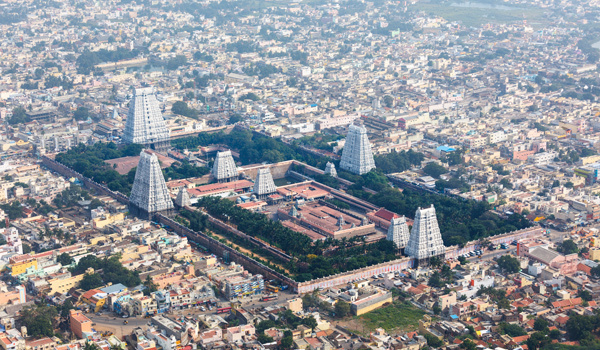 Thought to have origins in the 7th century, if not earlier, this enormous complex, famous for its many gopurams, or towers, is the crown of Madurai. Part of a UNESCO World Heritage Site, the Brihadeeswarar Temple in Thanjavur was opened over 1,000 years ago—all the way back in 1010. 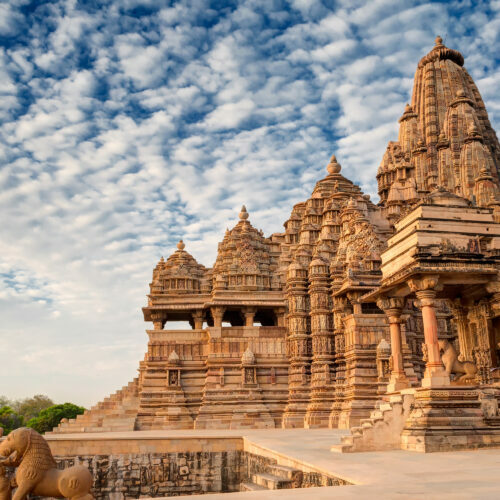 As one of the region’s most ancient temples, it’s a must-see for curious travellers; it also has the distinction of being one of the largest such complexes, with a tower that stretches dozens of metres into the air amid huge fortifications. Within its walls, Brihadeeswarar Temple is also renowned for the historic, colourful murals, which exist in varying states of preservation. Stretching across dozens of acres, the Thillai Nataraja Temple is large enough that you’ll need to come prepared with some walking shoes. South of Pondicherry and devoted to Shiva, the temple was initially sponsored by Chola Dynasty rulers. 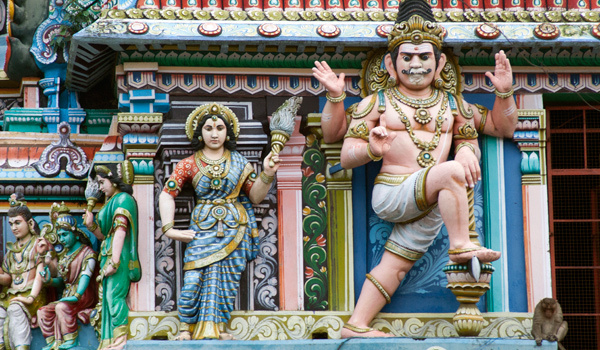 The gopurams here are meticulously carved and strikingly colourful, and depict figures in classical dance poses. With the verdant Anaimalai Hills serving as a backdrop (and themselves a sacred site), the Annamalaiyar Temple in Tiruvannamalai is uniquely picturesque among the famous South Indian temples. As with a true Dravidian structure, the splendour of its colonnaded hall can only be matched by its four gopurams—the Eastern one of which is one of the tallest in all of India. Pilgrims flock to this temple, in the heart of town, whose current iteration dates to the 9th century. 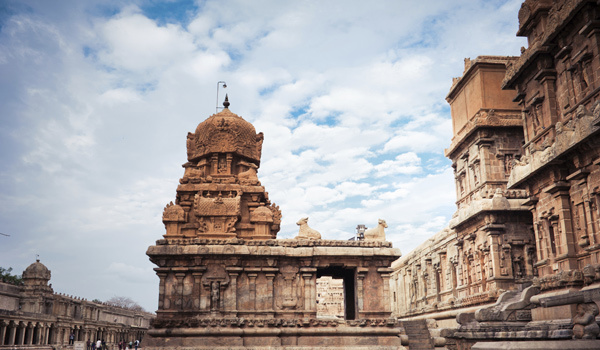 While not as colourful as some of the other structures on this list, the Ekambareswarar Temple in Kanchipuram is leant a bright hue, thanks to the fact that it’s constructed from white granite. Though its origins stretch back many centuries, this is one of the more modern landmarks on our list; its more recent constructions date to the 18th century. 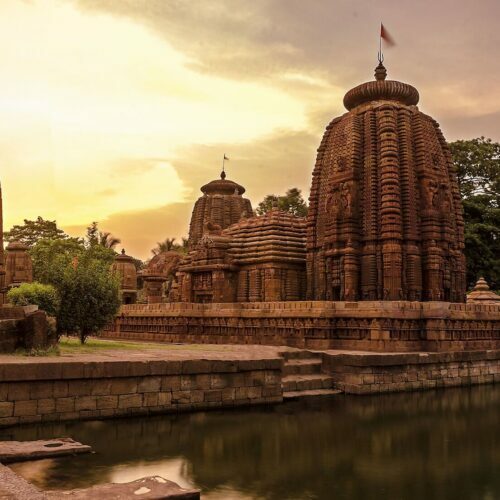 The highlight of the temple, though, may well be the 3,000-year old mango tree within its walls, which has a great deal of religious significance. 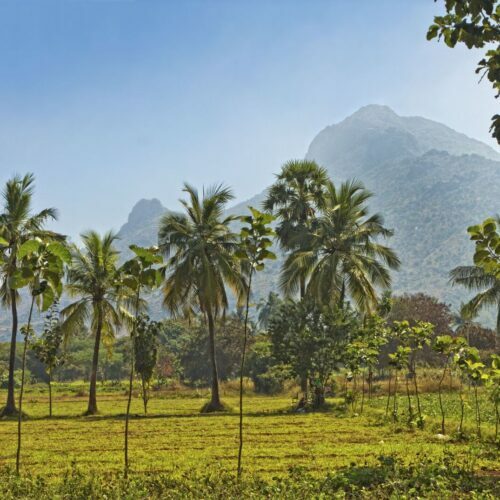 To explore some of these temples in South India, discover our Saffron & Sandalwood itinerary.